Gold and other metals fell sharply on Thursday as the US dollar rallied to a three-month high against the euro and eroded the appeal for commodities, to include oil. The greenback’s strength was also cited as a predicating factor in pulling down US stocks. Gold for February delivery plunged $28.80, or 2.5 percent, to $1,107.40 an ounce. It ranged from $1,142.90 to $1,101.60. Silver for March delivery plummeted 49.8 cents, or 2.8 percent, to close at $17.195 an ounce. It ranged from $17.805 to $17.115. January platinum fell $31.70, or 2.2 percent, to end at $1,425.90 an ounce. It ranged from $1,464.10 to $1,423.80. In PM London bullion, the benchmark gold price was fixed earlier in the day to $1,117.00 an ounce, which was a decline of $20.50 from Wednesday. Silver retreated 20 cents to $17.400 an ounce. Platinum was settled at $1,432.00 an ounce, falling $25.00. "Too many people are short of the dollar, and when they start to cover, the dollar could have a lot of big days," Leonard Kaplan, the president of Prospector Asset Management in Evanston, Illinois, said on Bloomberg. "I can’t see gold holding if the dollar rallies." "As the markets get further confirmation that the U.S. economy is gathering strength, the dollar’s strength may force gold to slide lower," Pradeep Unni, a senior analyst at Richcomm Global Services, said on Reuters. Crude oil prices declined slightly "as the dollar strengthened against the euro, limiting the appeal of commodities as an alternative investment," reported Margot Habiby of Bloomberg. "For the short term, a firmer U.S. dollar should prevent a further increase in the oil price," analysts at Commerzbank AG were quoted on MarketWatch. New York crude-oil for January delivery fell a penny to $72.64 a barrel. The national average for regular unleaded gasoline again declined four-tenths of a cent to $2.590 a gallon, according to AAA fuel data. That is 3.9 cents lower than a week ago, and 3.7 cents down from a month ago. The price is 92.3 cents more than a year ago. U.S. stocks tumbled "as the dollar’s rebound spurred a safe-haven trade, cutting demand for riskier assets, while a soft profit outlook from economic bellwether FedEx sank transportation shares," wrote Chuck Mikolajczak of Reuters. The Dow Jones industrial average fell 132.86 points, or 1.27 percent, to 10,308.26. The S&P 500 Index declined 13.10 points, or 1.18 percent, to 1,096.08. The Nasdaq Composite Index ended down 26.86 points, or 1.22 percent, to 2,180.05. Attention…Fed-Mart Shoppers! Sale Ends In February! It now appears that the rally in gold that followed the Fed announcement was nothing but after-hours smoke and mirrors. More of the same was manifest this morning: smoke from a 0.85 burn-out surge in the US dollar, mirrored by a more than $24 (2.13%) drop in the yellow metal. The euro broke to 1.43 as the greenback peeled out and rose to three-month highs against its rivals. At least this morning, the explanations coming from assorted trading rooms is that fears of implosions in Greece, Spain, the UK and who-knows-where-else are giving the US currency a strong safe-haven bid. That may very well be so, but we believe that the real impetus behind this dollar-comeback is yesterday’s realization that the Fed actually said: "Attention Fed-Mart shoppers! The "green light special" ends early next year!" instead of just implying that the status quo stays ‘quo’ for an indefinite amount of additional time. For those who read the text of the FOMC announcement, the timetables (try February) for the cessation of various limited-time offers are clearly spelled out therein. Commentators rushed to the airwaves yesterday, proclaiming that the Fed was in fact offering unlimited time to carry-traders already drunk on ultra-cheap dollars, and that hyper-inflation was (once again) around the corner. Looks like a round building, from here. Don’t look now, but the beleaguered US currency was –not that many days ago trading near 74.50 on that same index, and its obituaries were being carved in black marble. Silver lost 40 cents per ounce, to start the day at $17.29, while platinum fell $23 to $1430 per troy ounce. Palladium lost only a moderate $3 to $369 but rhodium went in a totally opposite direction, rising $180 (!) to $2240.00 per ounce. Meanwhile, gold-oriented ETFs are springing up faster than snowflake decorations at the local shopping mall. GoldEssential.com reports that, yesterday, "ETF Securities launched a new Swiss-based exchange-traded fund, which will be listed on the London Stock Exchange. The trust will be denominated the ETF Physical Swiss Gold, or SGBS, and will be fully backed by LBMA compliant gold bars and priced in U.S. dollars." Meanwhile, in far-away China, someone is busy-very busy digging for the shiny stuff. China Knowledge.com reports that: "China’s gold output increased by 31.47 tons or 14.10% year on year to 254.55 tons in the first ten months of this year, according to the latest statistics released by the Ministry of Industry and Information Technology. In October alone, China produced 26.35 tons of gold, said the MIIT. In the period from January to October, gold mines in the country produced 211.60 tons of gold, up 14.70% year on year, while by-product gold from non-ferrous smelters grew11.25% to 42.96 tons, said the ministry. In the same period, China’s top five gold producers, including China National Gold Group Corp and Zijin Mining Group Co Ltd. saw output rise 10.93% from a year earlier to 100.61 tonnes, accounting for 39.53% of the country’s total." "De-hedging by gold producers has emerged as one of the prime reasons for the rise in gold prices, analysts said. A total of 105 tonnes of gold was de-hedged by producers in the third quarter of 2009 and it played a tremendous role in raising the price of gold by nearly $50 an ounce. Though the volume of gold de-hedged – primarily by companies like global miner Anglo Gold Ashanti and Canadian miner Barrick Gold – in the final quarter of 2009 is expected to be large, no data in this regards is available as yet. The bullion price rose by almost $200 an ounce in the final quarter of 2009. "De-hedging by miners is one of the prominent reasons for the rise in gold prices. The producers initially held their expected god production with an expectation that gold prices will fall in future. They then de-hedge when they expect prices to rise in future," said Rozanna Wozniak, the investment research manager with the World Gold Council. "The amount of gold de-hedged by producers steadily rose from the first to the third quarter of 2009." According to World Gold Council (WGC), while 1 and 31 tonnes of gold were taken off the hedge books in the first and second quarter of 2009 respectively, a whooping 105 tonnes was de-hedged from the forward contracts in the third quarter of 2009. One of the most observable events with regard to the de-hedging of forward contracts in recent months was the announcement by Barrick Gold that it would completely scrap the fixed price gold sales contracts within a one-year timeframe. Market insiders said the phenomenon of de-hedging has continued for long. "If you de-hedge the fundamentals, you expect the gold prices to rise in future," said Jeffrey Rhodes the CEO of Dubai based INTL Commodities DMCC." However, the size of the remaining hedge book and the trends now in motion would indicate that this hitherto highly beneficial to the gold price phenomenon is drawing to a close. Many an analysis, by BNP Paribas VM Fortis Group, GFMS, CPM, etc.) reveals that the de-hedging programs in force in recent years are drawing to a close, or are shortly expected to do so. Much opinion-flavoured noise has, for example, recently accompanied the decision by Barrick management to stop all gold hedging. Gold perma-bulls have hailed it as the sign of the ‘all-clear’ signal for the lunar gold mission. Yes, this is the same Barrick that had once been sued for allegedly ‘illegally manipulating’ the gold price via its hedging programmes. And, the announcement came at a time when the trend back towards hedging shows real signs of life. BNP concluded that: "clearly this [process] cannot go on forever, and indeed this aspect of de-hedging together with its relevance to the global supply and demand balance, is coming to an end. Total hedging is likely to be by the end of the year 10 Moz or below, and while we expect the total to continue to fall, providing support to the market, the annual amount is unlikely to be very much more or less than 4 Moz. Even if for whatever reason the entire 10 Moz gets closed out, then it will only postpone the inevitable. In that (unlikely case) the gold market in 2011 would by definition have no support from de-hedging. This is going to be quite a fundamental change to the market in coming years: a reduction in demand equivalent to the entire US jewellery market ceasing to be, or put another way, an increase in supply akin to finding another South Africa (and indeed another Canada as well)." Stay tuned. Watch out for that vampirical dollar. 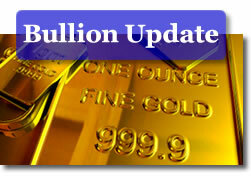 Check out additional market resources at Bullion Prices, the Coin Melt Calculator, and the US Inflation Calculator. For a gold coin news item of the day, read 2009 UHR Gold Sales End Dec. 31.